This article demonstrates how to find a value in a column and concatenate corresponding values on the same row. 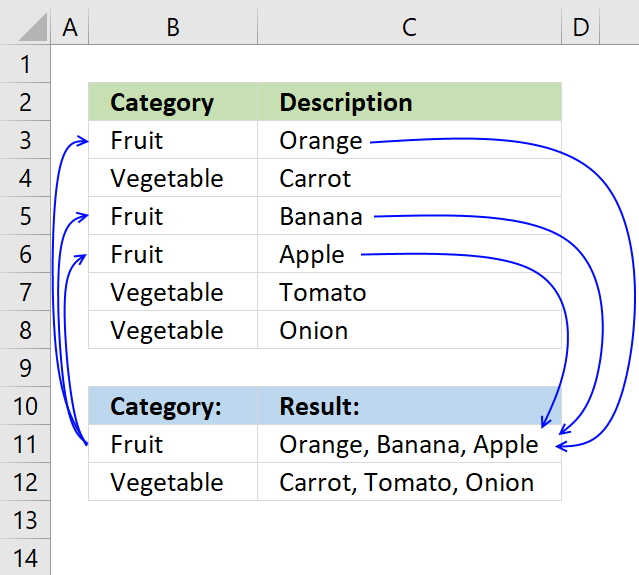 The picture above shows an array formula in cell F3 that looks for value "Fruit" in column B and concatenates corresponding values in column C.
The TEXTJOIN function introduced in Excel 365 (subscription required) allows you to easily concatenate values. It also accepts arrays and nested functions. However if your Excel version is missing the TEXTJOIN function you can use a User Defined Function, I have all instructions on how to do that in this post. The TEXTJOIN function is missing if you don't have the Office 365 subscription service. 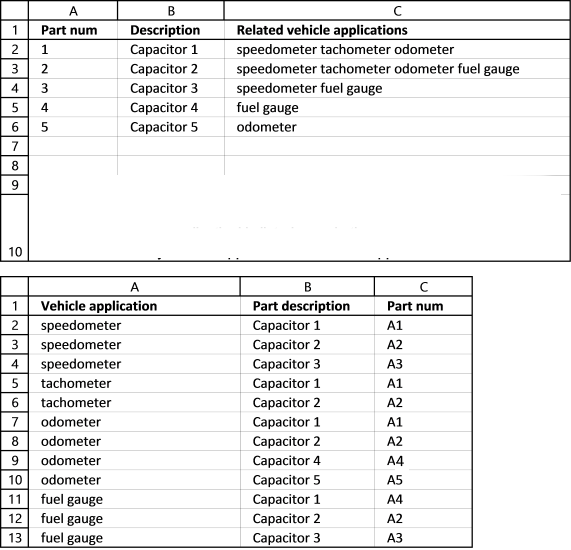 Looking for a formula that will take a part number from one column and go and look for all related vehicle applications per that part number and return the vehicle applications to a single cell related back to the part number. Dont enter these characters yourself, they appear automatically if you follow the instructions above. Then copy cell C2 and paste to cell range C3:C6. UPDATE: The solution below is for excel versions that has the TEXTJOIN function missing. I can´t concatenate values with a formula but I can create a small user defined function. 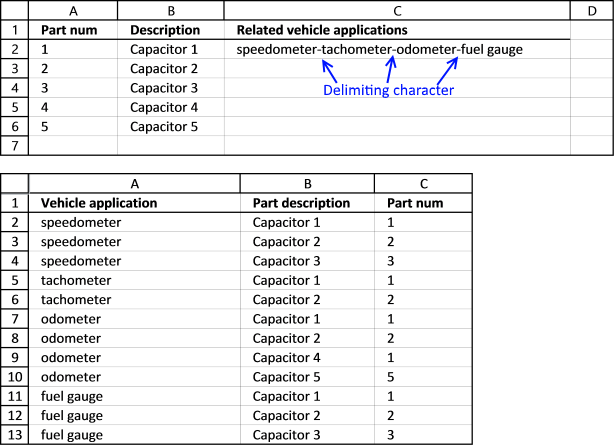 Picture of sheet "Vehicle applications"
Looks for a value in a column and returns a value on the same row from a column you specify. 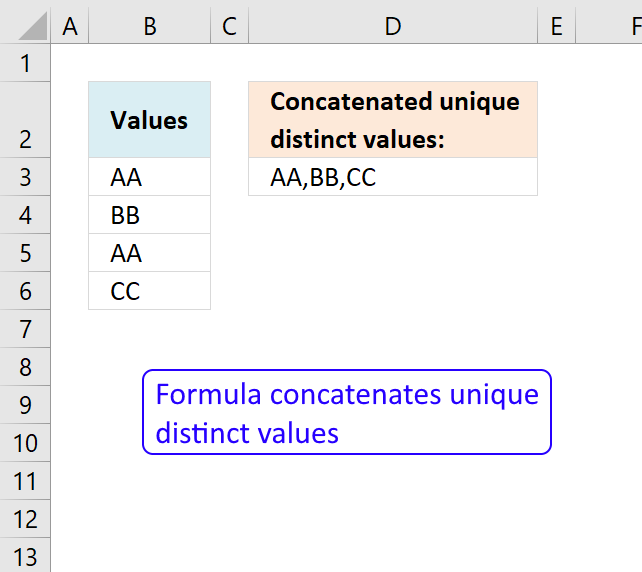 If multiple values are found the corresponding values are concatenated into a single cell. The picture below shows you "odometer" found twice in the table but is only displayed once in cell C2. In other words, no duplicates allowed. The array in step 1 has a duplicate value, to remove those we need to match the values to the list to find out which values are duplicates. It is certain that the value is a duplicate if they don't match. speedometer, tachometer, odometer, fuel gauge in cell C2. 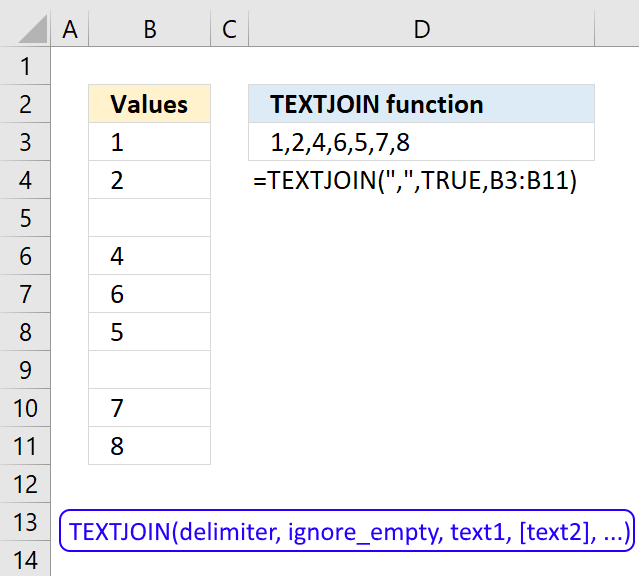 If your excel version is missing the TEXTJOIN function you need to add two User Defined Functions to your workbook. 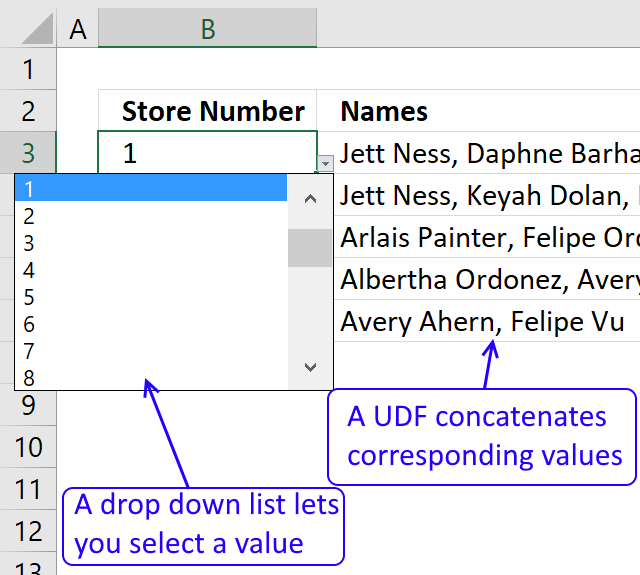 They let you return unique distinct values concatenated into one cell, one UDF creates a unique distinct list and the other UDF concatenates the values. The TEXTJOIN function lets you specify a delimiting character in the first argument. This UDF lets you specify a delimiting character in the last argument. 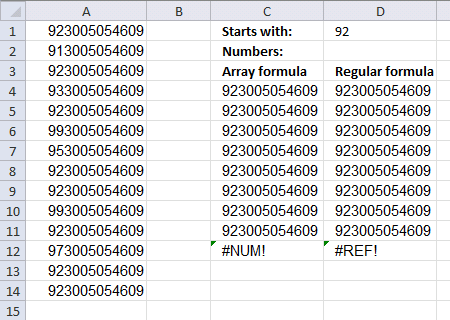 The way this works is that the formula in cell C2 checks if value in cell A2 matches a string in cell range C2:C13. In other words, the whole cell must not match but a sub-string must. Number 1 is found in cell C2,C5 and C7. and returns "speedometer, tachometer, odometer" in cell C2. The formula and UDF demonstrated below looks for a string that begins with the search string. If search string is a it will match ab, ac but not ba. ab and ac begins with a. If search string is ab it will match abc, abz but not bca. "speedometer,tachometer,odometer, fuel gauge" in cell C2. If your excel version is missing TEXTJOIN function you can easily use the UDF below. Excel sees dates as numbers so they can be used in formulas and calculations, Jan 1, 1900 is 1 and June 7, 2017 is 42893. To concatenate dates and not numbers we need to use the TEXT function to convert numbers to dates. "2014-01-03, 2014-03-10, 2014-01-14, 2014-02-04" in cell C2. 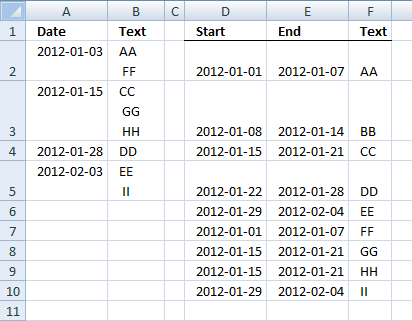 If your excel version is missing TEXTJOIN function you can use this UDF. 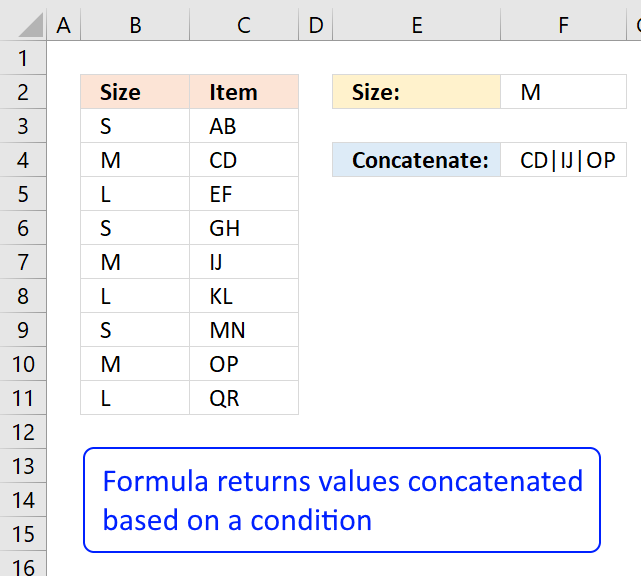 The following formula and UDF use a start and end date to filter dates in col C (table2) and return corresponding items in col A. "S, N, F" in cell D3. result = result & Return_val_col.Cells(i, 1).Value & ", "
This UDF lets you use multiple search strings and fetch corresponding values concatenated to one cell. Example, search string in cell A2 (table 1) is A+B, the search delimiting character is +. The UDF looks for both A and B in column A in table 2. Cell A2 and A3 matches A and B so the values from column B (Biology and Chemistry) are retrieved and concatenated to cell B2. This is a User Defined Function so to use the above formula you need to first insert a few lines of code to your workbook. Remember to save your workbook as an *.xlsm file or your code is lost the next time you open your workbook. Add cell values to a single cell with a condition, no VBA in this article. I just left you a similar comment on another page. Is there a way to do this and put the results into new rows instead of the same cell? A quick question though, if I need to search and return values in rows instead of columns, how can I edit the macro to reflect this? My interim fix was to transpose the entire table. Oscar thank for the quick response. Is there a way to do this without UDF? What I am trying to do is make an output matrix which has various wire types listed in column B4 thru B23 and terminating connector types listed across row C4 to AA4. I am trying to populate basically all of my open cells between C4 and AA23 with actual six digit part numbers. In some cases there are two six digit part numbers that must show up in the same cell. The data is being looked up in another tab in the spreadsheet with wire type in column C, part numbers in column B and connector type in column E. I also have a column called Standard flagged with a 1, 0 or black. 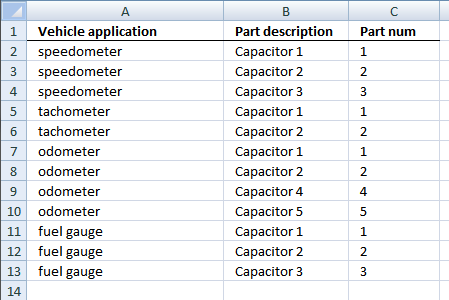 What I am currently doing is using a combination of Index and Match in my output matrix that looks up a part number based on three criteria, wire type, connector type and a standard part (flagged with 1). If a row meets those three criteria the part number is grabbed and filled into the output matrix. 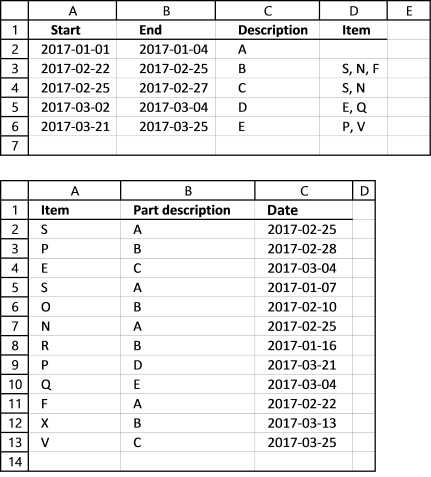 I have that part working, but don't know how to list two part number in the same cell if that condition exists. Is there a better way of doing this task? Thanks Oscar. Does the UDF stay with the file (embedded) if it is emailed and shared around the office or do you have to setup the VBA code on each individual's machine? The udf stays with the *.xls file. Ray, yes it can. But it would be easier to use this formula: How to return multiple values using vlookup in excel with a minor change. I want to use your above formula with a calendar in excel but I keep getting a #VALUE! error. F4 is the field that has my date I was to search for. I am guessing the dates causes problems. Select the same date in range Data!A4:A147. Are the values the same? Yes they are the same. I does work with vlookup but I want to be able to return multiple values. Send me a workbook without sensitive data and I´ll see what I can do. Wow Oscar, you rule! Searched the internet and beyond looking for this tiny fuction, thank you very much! Hi Oscar - nice code you've got up here, and great explanation. This is close to what I need, but I'm trying to take multiple input values and output to one cell. I'm doing a skills inventory, where someone could have multiple skills like say Excel and Powerpoint. I'd like to be able to enter multiple numbers and return multiple values - got any tricks for that? Thanks! Downloaded example, but showed #NAME? 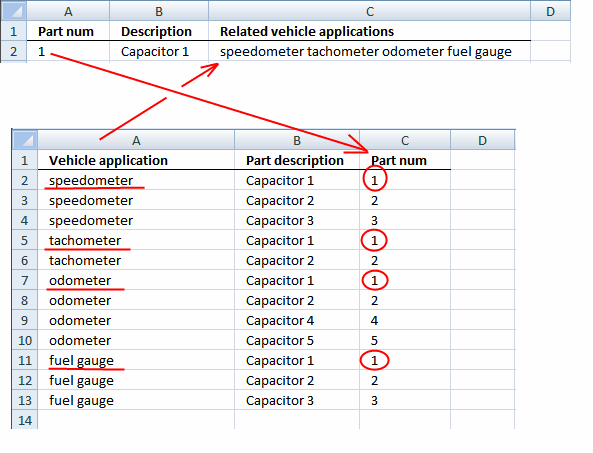 error in column C under Related vehicle applications. Looks like an error in the code? I downloaded the file and it works here. Is there anyway to get it to ignore duplicates entries? so that each 'vehicle application' is listed once in the 'related vehicle applications' no matter how many times it appears in the 'vehicle application' list? 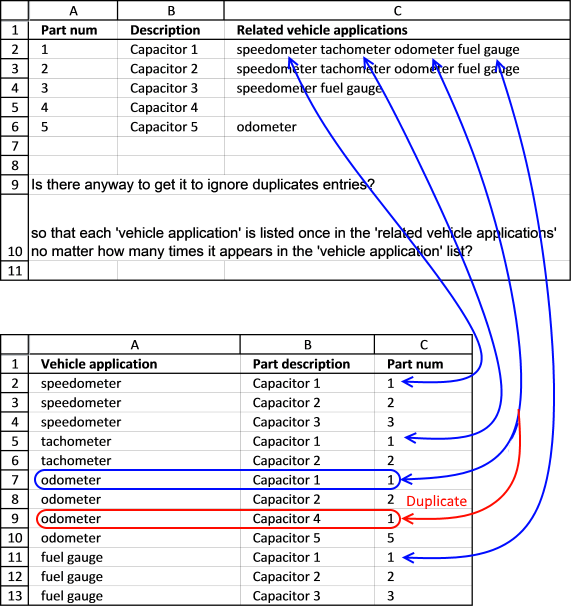 How would you integrate the multiple criteria lookup_concat function with the above mentioned functionality to remove duplicates? Hi Oscar thank you for your code it works well for me with a small exception. I have used your code shown to Tom (26th Jan 2011). When the code concatenates two or more text strings the text is placed on successive lines but there is always a ALT + ENTER character at the end of the text that adds an extra line below the last text string. Is there any way to prevent the this last ALT + ENTER from being added? This is great. How do I make this UDF available for all my spreadsheets without having to inserting it into each spreadsheet? This is so wonderful. Is there a way to add commas between each entry? Hi, this works great with the comma though is it possible to not start the result with a comma as it appears to do but end with a comma in the result? Was their ever a response to this? Is there a way to not start off with a comma but have any entries after the first be separated with a comma? That worked perfectly!! Thank you so much for your help! Is there anyway to get this to work by adding in a third factor? I have a similar list with part numbers, but I only want to concatenate the products (or stores in my case) that have prices. Thanks Oscar, I keep getting #VALUE! I believe this is happening because some of the search fields have #NAME errors. Any way to modify the script to ignore errors and continue looking? do you know how I could do that using the function that you created? I attached both a vba and a formula solution. I do recommend using the formula. Oscar -- found this with a Google search, and it is EXACTLY what I needed. THANK YOU for your contributions here!!! Saved me a TON of time on a vital project. Found this the same as Brad with Google search. This very nice and clearly illustrated example helped me quite a bit. I was wondering if you could help me change the column look-up to a row based look-up. Instead of searching in one column I would like to search in 1 row for a certain number. Then display the results just as you have done. Like the rest, I'm thrilled to find your formula. Could it be modified to have a second (and maybe third) search column, kind of like a COUNTIFS() function would do? Did you figure out a way to set this up with multiple criteria? Where I've put 17, just include the number of columns further away. Yes, see attached example file! I tried your udf and all the optional arguments. It works great, I am sure it will be useful! Thanks very much for this UDF. Very useful. Is there a way that you know it can be used in a data validation list? I get an error if I use it and I read somewhere else that it's not possible to use UDF's. Basically I have a large table with fields 'country', 'operator', 'plan'. In another table I want to select a country, then in a second column get a list of (unique) operators available in that country and select one, and in a third column then select a plan based on the country operator choice in the other columns. Your UDF (with the appropriate separator and a little tweaking perhaps) would be ideal for that, but I need to find a way to use it in selection lists. First off, thanks so much for all your help. Your site has helped me many times. My question stems off of Tom's question, and I've basically used the same code you've provided to Tom. My problem is, I have a range of a week (e.g. 5/7/12 - 5/13/12, 5/14/12 - 5/20/12, etc.) and from a list of individual dates, I have to determine if a date falls into that range, then it needs to return the corresponding text for each of those dates within the same cell (concatenated). So if I have a range of 5/7/12 - 5/13/12, I need the macro to look at a list of dates, determine which of the dates fall between that range, and return the text in the adjacent column to that individual date. Thanks so much for replying. My output would actually need to look more like a concatenated form of column F.
Column B would actually be a non-concatenated search input (with one date for each text). For example, given the date range from D2 to E2, the macro should look up which date in A2:A5 corresponds to that range, and return the concatenated form of each of the text. Kindly disregard the last post. I've figured it out using your explanation on this page and other pages on your site. I greatly appreciate the help you've so graciously given. I am using your function Lookup_concat to fetch data from some other excel file. But I am facing a problem. If I use Vlookup (built-in excel function), then I get the result even if source file is closed. But Lookup_concat function only gives result if source file is opened, otherwise it gives #VALUE! VBA does not support accessing information from closed workbooks. Excel Automation: How to use an external link as an argument in a user-defined function? I read your links provided, but i am unable to get the desired result, as I am not very much expert in VBA. Can you please help me how to modify LOOKUP_CONCAT function to get result from closed workbooks as well. I would happily help you out but I have no clue. Thanks Oscar for your valuable time. Thanks for your helpful website.I need to lookup in one column and return the results of two other columns.also I need to lookup in one column and return the results of two other column if the date in datecolumn in that row is equal to date in cell B2.I modified your vba code but i don't know it is correct or not beacuse when i put it in my spreadsheet it take a lot of time to calculate.and sometimes didn't work and return error value. Thanks for informative post. I need to lookup values from Column C (ticket #) based on Column A (Date) and Column B (Person). 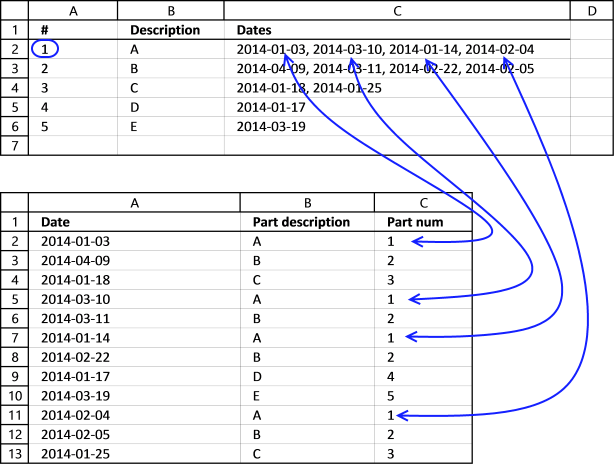 The look-up could return multiple values from column C (multiple tickets for a date). I need to concatenate multiple values in one cell of date –person matrix. UDF discussed here works but only problem is that it is not doing lookup on multiple columns. Can you please help? Thank you for this - it's a brilliant, simple solution that works a treat. TO echo the question Peter posted in March - is there anyway to modify this formula and UDF so that it searches multiple criteria in 2 different columns? Hi Oscar! Are you having any luck with this? I've looked everywhere for help with this and nothing...I'm counting on you! Just discovered that this is case sensitive - I was confused that it wasn't finding things that other Excel functions (such as VLOOKUP) can find. How can I make it ignore the case of a letter? To force the source and the user input to be the same is not practical, unfortunately. Ignore previous comment. To resolve the case sensitive issue, pop "Option Compare Text" on a line at the top of the module and searches will not be case sensitive. Oscar, you are a life saver. I did have to change on line of code to get it to work for my needs. Is your function able to search based on multiple criteria and return multiple values concatenated into one cell? This is what I'm desperate to find an answer for! It is a function, so you can call it for each of your search words and concatenate the results together (if you have a lot of search words, you may need to construct a loop to process them efficiently). If you want me to add additional functionality to my code, post the request against my mini-blog article over in my blog-site's forum location and I will attempt to comply there. How would change search_string to lookup any value greater than 0? The code works great, thank you! I keep getting #VALUE for items that do not have a match. I have a calendar and some things are in progress, planned, etc. If for a day, there are no planned items, I want it to be blank in the planned column...can't seem to figure it out. Can solve it with IF(ISERROR), but would like to incorporate into UDF, and can't seem to figure it out. I tried the udf for items that don´t have a match and I get a blank cell in those cases. I am using excel 2010. I am using Excel 2007. 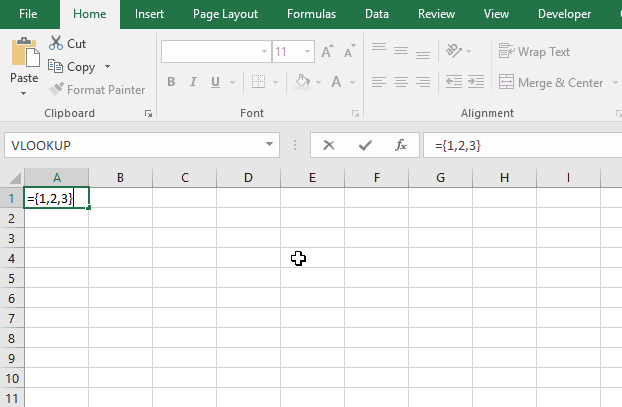 The code Rick referred to worked, but it makes Excel hang way too much. Yes, I have found the same issue. Is there any way to adapt this module to look in values? Hi I was wondering if instead of showing the results separated by a space in on cell, I could make the results added to eachother in one cell. I'm trying to lookup more than one value (number,e.g.prices)but show it added to all the other results. @Ralfy - I am having trouble visualizing what you are asking for... can you post a small sample of data and show us what you want that data to look like after it has been processed? Then there is worksheet for each person where it looks up the sales, credit and productivity for that person for the day. All of that I already have set up using vlookup. My issue is when the data sheet has more than one entry per day per day. I would like the lookup function to recognize more than one entry and add them up then insert to the persons worksheet. Thank you in advance for your help, I hope to resolve this issue soon.I have a file, Cells A1:A50 have multiple e-mail addresses separated by ";". On Column B, I have a list of 1,000 e-mail addresses, each cell on column B has only one address. What I am trying to get to, is on Column C, to see which e-mails from cell A1 are found in the entire column B. Then which e-mails from cell A2 are found in the entire column B, and so on. If I need to send a spreadsheet please let me know. Thank you for your help. Ha, dummy me, I was thinking it too complicated, with Index and Match formulas. Should have thought the other way around, many thanks for your help. Alright, here is the next step on this. 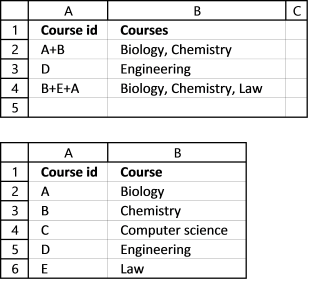 Now that I can find which individual e-mail address from Column A is listed in the entire column B, I need to do a look-up and give me the corresponding category listed on column C.
How would I go about finding which value from Column A, is listed in Column B and then list it's corresponding value from column C? What is this? Three emails in the first cell in column B or where are they entered? Correct, Column A cells have individual addresses that are listed somewhere in the multitude of e-mails from Column B, which then have a corresponding category in column C. So while column A lists only 1 e-mail per cell, Column B cells have anywhere from 2 to 10 e-mail addressed in one cell. Then column C shows the category in which those e-mails belong. I need to map correct client ID based on lookup by client name and then based on finding which service date range does client file created date fit into. 2. Second search - Within that range, I need to find fitting date range. Your lookups are great when I search entire sheets but I need to do second seach based on subset of data. Thanks for posting very nice and effective UDF. I had to change one line of code to get it to work for my needs. but cannot omit last comma from the returned value. Any help in this respect will be highly appreciated. Thanks in advance. Hi Oscar...this is a very interesting function and helped me a lot so far. My file though is a bit more complicated.. I have multiple info in one cell separated with ";" (example AD1; AD2; AD3) lets say that these are servers (File name SERVERS) and in each server I have multiple applications. I have now another file that has all the applications per server per line in excel (each line has one server one application. File name: APPS). I want starting from the file SERVERS to look up the servers that are in one cell find them in the second file APPS and bring all the applications also in one cell in the file SERVERS. You don't happen to have a fix for this by any chance??? I tried a nested formula and it works here (excel 2010). ok, so I realized that when I was watching my macro run step by step using F8 it appeared to be stuck in that loop once I hit your function. Once I just ran the macro (including your function) it worked perfectly. thank you for checking that. Do you have a place where I could continue to ask you questions with excel unrelated to this function? Do you have a place where I could continue to ask you questions with excel unrelated to this function? No, most people search my site for answers. If they can´t find what they are looking for, they ask questions in blog posts. I have a similar problem, but am finding that to search within vs for an exact value is causing the CONCAT formula to not work? Trying to look for value D2 withing column 2 of a Table1, then to return all values in column 3 of the table. Don't care if there are commas separating them, etc. Forumla only seems to work if it looks for an exact match. How do I change the following? What am i doing wrong? The formula is returning nothing each time, though not getting any error?? Additional question on this: the formula also does not seem to allow me to use named ranges vs selecting the range each time. Is there a way to update the formula to allow for named ranges? you are unbelievable! THANK YOU SO MUCH for all the answers! I assume you don´t want to use CSE? (Ctrl + Shft + Enter) No, not to my knowledge. Why did not you reply if you saw the question on Mrexcel board...? A trackback is created when someone links to my website. That´s how I discovered your thread. I love this function, but know very little about VBA. Can anyone suggest a way to tweak the code a bit so that the return results are delimited with a semicolon and a space, rather than just a space? thanks for your code , i use it for a file for same searching values and it Work fine. for exameple i only wana one value that is : < or = a value of an other cell ( 57) in this case i only get : 56 .
could you please give me an edit code. This function looks like it's going to do exactly what I need it to do, however when I use it I get in my list I get #VALUE. I believe it's because the returned values are multiple email addresses (name@domain.com). Is there anyway this would work with email addresses? This function looks like it's going to do exactly what I need it to do, however when I use it I get in my list I get #VALUE. I am not sure whats wrong, maybe you don´t use absolute cell references in the function? I believe it's because the returned values are multiple email addresses (name@domain.com). Is there anyway this would work with email addresses? I am sure it works with email adresses and duplicate email adresses. The problem is that if the originating cell is empty, a bullet still appears. Is there a way I can modify the above code to eliminate the bullets for empty cells? Thank you for your quick response! The above code is sooo close... Instead of bullets, the blank cells now report "#VALUE!". Preferably, the blank cells would just be empty, but perhaps I can play around with the formula a bit. Hi Oscar. Thank you so much for sharing your extensive knowledge with us. I have a question. I am using that function that you gave for adding the values of the cells that I lookup .... =SUMPRODUCT((I5=C4:C32)*D4:D32)(Combined with the vba).... But I also have a need to find the average of those cells. Do you have a formula for that? I don´t understand, can you explain in greater detail? This formula seems to work down a column, but I can't get it to work across rows. How would you amend the basic formula at the top so that it worked to compare 2 rows? Thank you for sharing your knowledge. This is extremely helpful. I have a big excel file (around 22000 rows and 20 columns). Below I have tried to represent it in simplified way. Left hand side is my raw data and Right hand side is my desired output. If you can help me do this using functions (no vba code) that would be great. Please note all data is text. I tried to upload the image but, does not look like it worked. Let me know how this can be resolved. This has been a great help to me. I'm trying to get it to do one thing that I can't figure out though. For my application, almost all the lookup values are "1". I do however have a few instances where the lookup value could be 2 or 3. Is it possible to to use a range, e.g. 1-5 for my lookup value? Thank you. Had an query, i want to use this function within my macro by calling it, How can i do define 'Search_string', 'Search_in_col', 'Return_val_col' as an input and run this function cell by cell? Got it no need to reply... thank-you... thank-you very much.. god Bless u. If columnA=X AND columnB=Y then return columnC values concatenated into single cell. Still unclaer as to how I would achieve this.... if anyone could enlighten me I would be extremely grateful! E.g. If columnA=X AND columnB=Y then return columnC values concatenated into single cell. Just what i was looking for. Clean and simple. I cannot get the UDF to work properly within my file for the life of me. I need the values to populate with the project name on a project timeline chart based off the project schedule. Similar to the post on May 25, 2012 but it does not work in my sheet. It is not recognizing the date range and multiple values. Basically, if i have three projects starting on any date in January the project names should populate for that month in col I. My Column E contains comments on each row (E2 has comments/text, E3, has comments, text). I also have a list of available keywords (O2:O2330). In H2, I want the formula to look at E2 and return each keyword (O2:O2330) contained in the text field (e.g., E2), ideally with comma separation. What formula do I need to check all the cells in Column E and bring back all the keywords from each cell? I found this via google, and tried copying the vba code into my excel 2010 spreadsheet - BUT unfortunately, getting the "#NUM!" error. I modified and changed "," with";" without success. Is there anything wrong I could be doing? Did you paste the code into a module? Firstly - thank yous so much for this UDF - it is almost exactly what I needed. I'm new to using VB and have tried adding both your duplicate and comma samples above but this seems to be confusing the calculation. What do I need to do to be able to both ignore duplicates and add a comma between each value? The original lookup value I have sometimes appears in a cell with other numbers and it doesn't seem to be picking up these particular options when concatenating together. Is there any way for these others to be picked up as well? In order to do this in one of the other cells I had to add asterix's etc ("*"&B96&"*") to make it work - assuming this works the same how would I add this to VB? Read the accompanying text as it will tell you everything you need to know, but just to emphasize... make sure you set the Delimiter argument to a comma, the MatchWhole argument to False and the UniqueOnly argument to True along with any other arguments. Hi Oscar, great UDF. Is there a similar code to search in rows and return the values to one cell? great UDF. Is there a similar code to searches rows? Hi thanks for this above code. But I need to return concatenate using multiple criteria rather than single criteria. I am happy you find it useful. Thank you so much for this code, it's amazing! I have a fairly large table that I want to use this on, but keep getting a #VALUE error. I've played around with the inputs and noticed that I start getting the error at certain range sizes. For example, if the range is only 100 rows (say E3:E103) it would work just fine, but the moment it hits a random number (and this number seems to vary by the spreadsheet I use it in), usually anything over 500 rows, then I get a #VALUE error. Any thoughts? The values it's returning are quite wordy since they are security roles to a system. I'm trying to think if there is a character limit I'm hitting somewhere? Or maybe there is a row limit? I've tried this with your original code, and with my modified code (below). In your original spreadsheet I expanded your sample data to be more than 2000 rows and it worked, but with larger Excel files and larger tables it seems to start getting wonky. I've played around with the inputs and noticed that I start getting the error at certain range sizes. For example, if the range is only 100 rows (say E3:E103) it would work just fine, but the moment it hits a random number (and this number seems to vary by the spreadsheet I use it in), usually anything over 500 rows, then I get a #VALUE error. Any thoughts? The values it's returning are quite wordy since they are security roles to a system. I'm trying to think if there is a character limit I'm hitting somewhere? Or maybe there is a row limit? 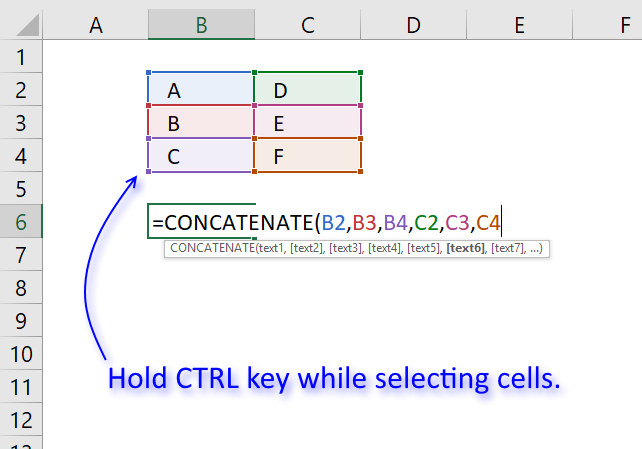 Excel 2007, 2010 and 2013 have a total number of characters that a cell can contain. 32,767 characters. They are wordy, but not that wordy. I can't seem to figure out what the problem might be. It really shouldn't matter because the string it returns won't be that long. Even if it might be for 1 or two of the cells that it would return values for, it wouldn't do it for all of them, so theoretically the ones that have smaller values should still show up. However, when I increase the range size it gives me the #VALUE error for all of the cells I use the function in, even if the value it's supposed to return is blank. Any thoughts on what to look for? ALT + ENTER Code resulting un-necessary space, pls can you tell me how I can remove that space. Glad to find your code of "Lookup and return multiple values concatenated into one cell - ignore duplicates". It is very close to what I need for my workbook. I have to lookup the values from several worksheets and remove any duplicates from the results. Very beautiful UDF. It helped me a lot. Is it possible to add sumifs into this UDF. Column A is having Names, Column B is having Location and Column C is having Total Amount. Result by using the UDF am getting desired result. For each Name, number of locations is dynamic, for some criteria there could be 1 location for some it could be 3 and so on. In column D, I need to get sum of Amount based on each resultant value from the LookUpContact result. Thank you so much for sharing this! It was exactly what I needed up until I needed to retrieve multiple values based on criteria. I just don't know how to accomplish this. I have a long list of Suppliers who are meeting with Buyers on specific Buyer Needs. Some Suppliers are meeting on 1-5 different Buyer Needs. I need Column C (Buyer Need) to return a concatenated list with new lines for each need. However, I only want the needs of Buyer 1 related to Supplier 1. Sorry, the spacing is off... the Need 1, Need 2, Need 3, etc. are in the same column in a single cell. Oscar, this formula is the BEST THING EVER! One question though. If I only need to return values that start with a certain letter, how can I integrate that into the function? Thank you very much for sharing the formula, I am so lucky to bump to this website as this is the formula that I exactly need. However, I have problem on the excel report processing upon enabling the macro. is there any limitation in number of rows in database? Hi Oscar, I love your website! I don't have any experience in UDF/macro/vba. I copied vba code (lookup and return multiple values in one cell) and it works well and solve my problem. However, I face another problem; the excel file take very long processing time to change values related to the UDF code as I saved the file in Macro enable worksheet (Microsoft Excel 2013 - file format .xlsm). if I saved in xlsx format, the processing time is fine (the file size is only 800kb), but the function (UDF) is not working at all. Thanks for the code - FANTASTIC! Is there a way this function can be applied to concatenate results based on two different criteria? great UDF. Is there a similar code to searches rows?" Like Cormac's statement above, is it possible to look up the row numbers of the cells that contain the value being looked up? The above function gives 2,2,2,2,2,2 with the code I have. But, I want it to give 2,3,4,5,6,7 instead, which are the row numbers of the cells that contain "2" in the specified column. Thanks. This works just fine. What if I want to apply this to rows instead of columns, that is (Look_up_value, Search_in_row, Concatenate_values_in_row)? Is that possible? I am looking to return multiple values concatenated into one cell between a specified date range.... I have gone through the thread above but I can't find anything relevant. I wonder do you have any formula that can help me? I am trying to use your VB code on a list that has hidden rows. However it is returning the hidden rows. Is it possible to only return data that is visible? Why do you need to use Trim() at all in the VBA code here? Also, why is Len() - 1 required? The code works fine without it...? Is there a way to return values that fall within a specific date range? I am trying to attach collection notes made through out the month onto a spreadsheet with customer names and phone numbers. I would like the "notes" column to have all of the notes for the month into one cell. I have a spreadsheet where the notes are listed in table form. I would like to search the table based on the customer number and return the notes based on a date range. I tried to sort the table to only the current month, but it returned the hidden rows. It tried to put in a date range, but only received an error message. Thank you so very much for providing this code, and also for helping us all out. Thank you Oscar for your effective solution. I would need the result based on multiple criteria. As per following chart, I need a person wise client names with Amount in one cell based on the date. Thank you so much. Is there a way to concatenate adjacent cells based upon their value (such as anything greater than 0)? I only want to concatenate the text in columns NALC and GROUP if the qty is greater than 0. The below should assist in what I am trying to achieve. Great UDF. I'm trying to change the colour of the (result) font to match the search_in_col.interior.color but i'm unable to get it to work. Here's what i have....i get a syntax error. PS my function is called Actual_concat because i'm doing a compare of lookup v's acutal into the same cell, therefore need to change the Actual result font color. I don´t think you can do that with a user defined function. I need your help to build a macro. Worksheet can contain "“TICKER”", "“SEDOL”", "“ISIN”"
3. if Ticker is available it will replace with "Identifier 1", then have to search for "SEDOL" if it's available it's have to replace with "Identifier 2"
Thanks for the help with this UDF. Sorry, I did also have a question too....but my browser seems to have crashed. Similar to TammyW, wondering if there is ANY way to match original font. If not, not a HUGE deal. The other item is related to what others have inquired about; using the multiple criteria UDF where instead of matching exactly, looking to return values that are ">0". Cn this be achieved with nesting a formula along with the UDF? I have tried several permutations to no avail. Any insights, advice, wisdom would be greatly appreciated. Thanks again for contributing to the greater good of ALL excel junkies! Maybe what I am trying to do is impossible but.. Column E = (Formula column) each cell needs to show what events are occurring on the corresponding day of the year (column A) and display all of the event names that apply. I am also trying to search a row as one of the commenters did and I tried your method but it didn't work. MsgBox "Please enter the Mandatory Numbers (Site, Donor or Visit Number)"
One issue I have is I need to remove the blank cells from being included in the results. I only want those cells that have data to be concatenated into one cell. Is there a line I need to add to this VBA code that can do that? Thanks! Hi Oscar - This did exactly what I needed it to but it keeps crashing my excel. Is there anything I can do to prevent this? Could I set it up so it only resfreshes when a button is clicked? This code is amazing, saves me a lot of time. Meaning that it would take me about 40 minutes for the entire range. I want concatenate all the True's i.e like _10075_10076_10077_10078. 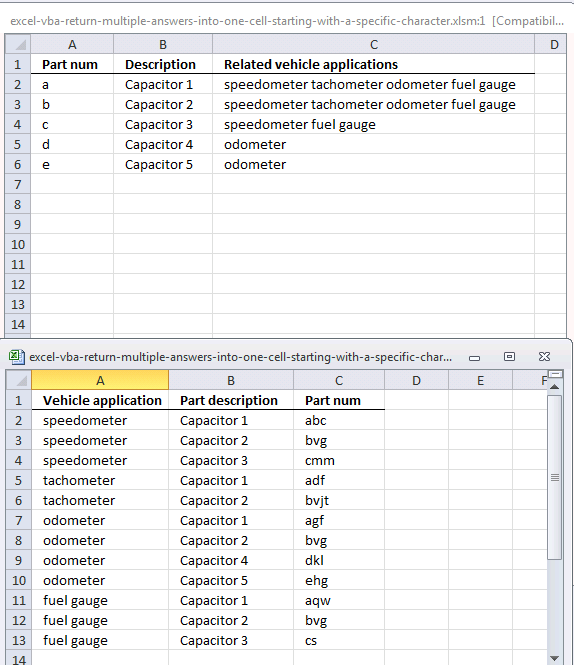 This is great, I am having a particular issue in that I would like to enter each vehicle application (in the vehicle application sheet) as a singular row, with the various part #'s listed in the one cell and sperated with commas. Eg. speedometer 1,2,3 rather than tree rows for speedometer. Any help with this would be amazing! These codes are fantastic. I've read through quite a few inquiries and didn't get to one similar to mine. So I apologize if this is a repeat inquiry. Your original UDF code is almost perfect for me. However I have 3 columns to look up, and then combine multiple cells (text) from another column. I've got a date, project code, and a task number. I also have multiple descriptions of work performed that need to be combined according to the date, project code and task number. Do you have another UDF for this? Thanks so much for your work. Excel rocks. Hi, I have a problem I'm stuck with and I'm hoping for a formula rather than VBA. I have two columns. What I want to do is search the list in column A and I wasn't to return all the matches in column B into column C like 326087,326088,311410.....etc. Like a vlookup but return all the matches separated by commas? Im using this udf...it is working well when looking up text, but with numbers it is not returning a value. I'm new to vba and not sure what is wrong. Could you please tweak the below macro to get the intended results. This macro is working fine but, Macro pasting the all body data in to Singe cell. Actually my mail body had tabular data. 'Pst_Folder_Name = "inbox" 'Sample "Inbox" or "Sent Items"
I've used your udf and after a few minor tweaks I've found it to be very helpful for my needs. My only problem is that the introduction of this formula has severely bogged down the processing time of my workbook. Curious, in all of your tweaking of this udf based off of various questions and requests, have you found any good optimization techniques when dealing with large amounts of data? For instance, I have 60k+ data points which are my individual search strings, and the Search_in_col and Return_val_col ranges have 10k+ data points. Is there a way to optimize this code such that the calculating time is significantly reduced? I am trying to use this to save some manual time for a staff member. When using this for our needs, we may have 3-5 results in the cell. Sometimes we have a large amount. Is there a way to have it cut off the results after a certain length (or number in the array) and maybe put in something like "Plus 30 More"? Let's have a cutoff of 3 results. A cell that will return 3 or less results will display all of them: apple, banana, grape. A cell that will return 4 or more results will display the first 3 and then remaining text: apple, banana, grape, plus 2 more. Is it possible to do a similar lookup function on a cell that has multiple values? As background I work at a university and have a list of subjects and the courses they belong to. Some subjects belong to multiple courses. The way this is displayed is A+B+C. What I need to know is all the courses subjects A, B and C belong to. The above VBA works when there is a absolute match but not when there are multiple values in the lookup cell. That new code still only returns values when there is a single subject in the cell being looked up. As soon as any other character is in the cell the lookup returns a blank. Unfortunately I have a lot of these co-taught subjects and they are of varying length so I would rather avoid having to delimit them into separate columns. Const InDelim As String = "+"
Const OutDelim As String = ", "
That's exactly it! Thanks very much for your help. all I want to say is THANK YOU!!! I've been looking for this solution for almost a year. I didn't even consider UDF. Works perfectly!! just used your tips above on a problem I had in a similar case where I needed to return multiple values in one cell. It worked out so far. However, I also need to have a line break after each cell's content. As I'm not really familiar with VBA (and a little proud of me that I made it so far) I was wondering if it is possible to to get this included? but didn't got it running. See function a few comments below. That is terrific - it works great! as I said before your code works great but in my case I do need to run it twice over two different tables and then check if it has identical content or not - I use CONDITIONAL FORMATTING. While diving into your code I realized that you used TRIM already, but this works only at the last row of each result. In my case one result comes from a table that contains already all results in one cell, the other table contains the values to be collected in different cells. This one causes the additional invisible characters. Do you know how to solve my dilemma? I appreciate your repeated help! Hi Oscar, This is a great pice of work. I try to marge two macros and do multiple inputs and matching date range. I use your examples but cant get the result. Could you or anyone her help me with this one please. Yee I fix it, right now when I look on this it does not looks very simple. Now Is something much harder to achieve. I have duplicates value which I need to delate any suggestions? Hi Oscar, Thank you for a great code. want find number 4 =< or bigger in column where in cells we have few numbers (1|2|3|4|5|6) separate by "|"
In here I want to use some split function but not sure how. Thank you for the LOOKUP_CONCAT function. However, I face a performance issue - the excel freezes for a couple of seconds each time I run this function for just one row. It depends on how much data you work with? And if you have many othe cpu intensive tasks in your workbook? It is possible to make the LOOKUP_CONCAT function much faster. I working on something like this to have different variables. Cable you help me? I want to get a return of value on worksheet "index prod" E1 if I match A2 left 10 characters in Worksheet "indexprod cell E2:E8. Also to get return value of worksheet "index prod" F1 if I get a match A2 left 10 characters in Worksheet "indexprod cell F2:F8. Here is user defined funtion I am using. Thank you for your page, its been helpful, but I am now stuck with my limited Excel exposure. Hi Oscar, this is a great work! Thanks so much. I was looking for a way to concatenate only the unique data instead of all that is looked up. Hi I am trying to add the two user defined functions - one for the lookup_concat and the other for the ignore duplicate values, but I have a couple of questions. I tried to read the comments to see if they were answered but there so many of them! 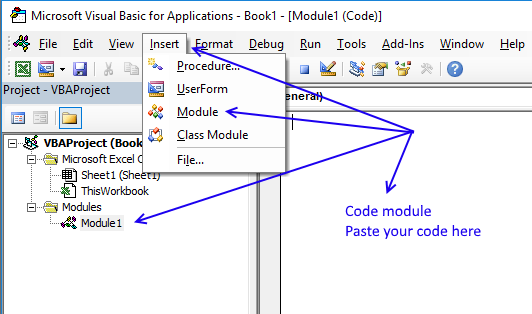 1) Do I add two modules one for each VBA or do I put them in the same module? 2) Do I add the modules in the workbook that I am working on onlY? You can put them in the same module. You can also group your macros in different modules if you prefer that. how do i combine multiple of these into one UDF?I would like one UDF for #1, #2, and #3 listed above. also, instead of selecting one cell for the value to look up i would like to select a range of cells. but the range should be dynamic with the number of rows in the range being the number in cell A1. I'm not knowledgeable with VBA. Below is the function I found in the web that suits my needs, but it takes time to run it. I don't know how to write it together with the optimizing codes though. I tried Text join for my data. I am getting the error #NAME? Is there a reason to show this error. It worked when i tried a subset of data. But it didnt work when i tried with the full data. @Oscar and @Rick Rothstein who modified @Oscar code for more useful. It saves a lot more time for our work!. "The picture above shows an array formula in cell F3 that looks for value "Fruit" in column B and concatenates corresponding values in column C."
I do not see the corresponding array formula, just the screenshot of the result. Now I wonder if I misunderstand something, the formula is really missing, or I just don't look at the right place. you are right, it is confusing. I have updated the article. Hey Oscar, this is a HUGE help. For the UDF, I am trying to combine the elimination of duplicates, with a delimiter string. I've tried a few different ways, but I'm not good with VBA and end up with extra semi colons (as my delimiter). Can you help me combine those two codes? Thanks in advance! !